Was anyone else dreaming of Coachella last week and drooling over some of the ensembles that the celebrities and fashionistas were rocking? Well I wanted to kill myself but yet still put myself through the pain of looking because I couldn't get enough of some of the outfits this year! Coachella is called a festival for the good looking and it's certainly that- its got the 'Coachella Cool' factor which everyone lusts over. I don't know whether I was more excited over Kate Bosworth sporting items from the 'Topshop Festival' collection which will be out in high summer or whether it was Katy Perry in the D&G co-ord, but whatever it was it sure got me going and like every year Coachella is one of those things I really need to do! For me the festival season is where I can really show my true colours! You don't have to tell me twice to wear my one of five feather head dresses! I love everything festival, bright colours, layering, textures, clashing prints , accessories, big chunky boots, bumbags, glitter and sunnies. What's no to love? Any excuse to rock messy hair, minimal make up and be covered In mud I'm all for it! I have been so impressed with my latest vintage finds, they are true vintage originals and came all the way from America. 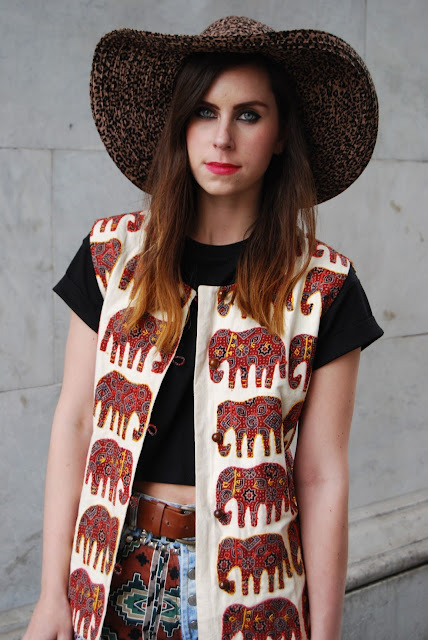 My most recent, the elephant top which is handmade and hand batik and has little wooden buttons. 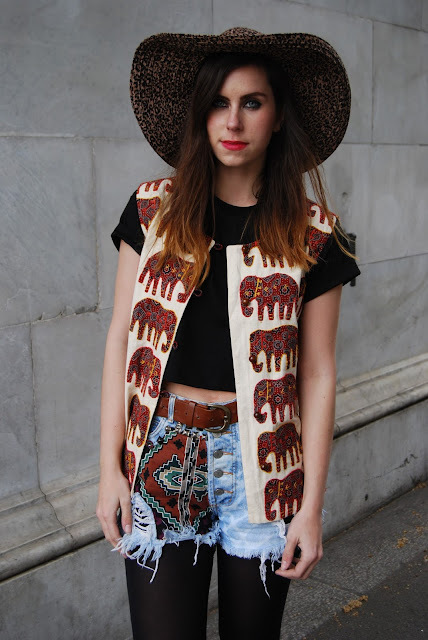 Elephants have made a come back this year in summer safari trends and as seen at Coachella. The shorts are also vintage, I love the colour and print on them. I wore them together because I wanted the look to be quite tonal all the rich browns together and finished off with my huge leopard floppy hat which would be essential for me at Coachella. Less is more with accessories, a simple belt and sunglasses were enough to finish off this look. Oh and don't forget the trusted backpack which would be clearly full of wonderfulness at a festival: glitter, headdresses, wet wipes and alcohol! Different festivals around the world have a certain style to them like an unwritten dress code, so we are going to do a Glastonbury inspired post to show the difference and we know you guys are super excited about Glastonbury aswell! Keep your eyes peeled over the next few weeks for more festival vibes. GORGEOUS outfit, love the shorts! Such an amazing outfit! I love the shorts!